Upgrade outdoor café and patio experiences by adding a textilene umbrella to round or square thermoplastic tables. The umbrella material is constructed with a resistant, mesh PVC coated polyester fabric, supported by eight 3/8" zinc plated spring wires, allowing this 7-1/2" round umbrella to stand strong during tough outdoor conditions and heavy use. A lightweight and weather resilient 1-5/8"O.D. anodized aluminum pole features a 3 position umbrella tilt capability. 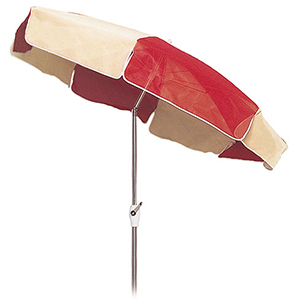 Opening and closing this all-weather textilene umbrella is a cinch with the crank lift. Many popular colors available to best suit any facility theme.